If there's one thing I've realised about myself it's that I can't stand to hear about people missing out on delicious food. Having food intolerances, food allergies and coeliac disease myself, I know what it feels like to miss out - and now I know just how hard it is when you find yourself with a mile long list of foods you can't eat. When I was first diagnosed with coeliac disease and found out I had a bunch of food intolerances due to the damage gluten had done to my stomach, I felt like I was destined for a life of white rice and bland, boring meals.... luckily I decided that just wasn't going to work - and this foodie got to experimenting. I got an email a few weeks back from a reader who took me right back to those days. She just found out she had coeliac disease- and she also has a world of other food intolerances too. And that baby really wanted some cookies. So Emily sent me an email, feeling like I was the only one who wouldn't call her crazy - and someone who could come up for a recipe that would work just for her - and boy oh boy was I excited to receive her email with this challenge! 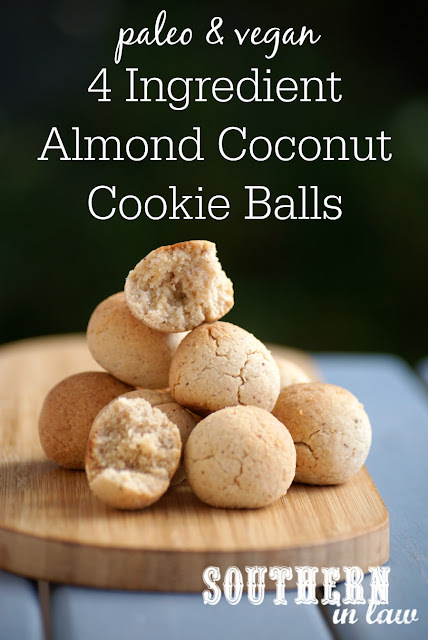 I got to work creating a cookie recipe that was gluten free, paleo and vegan - and I even tested to make sure it could work as a nut free recipe so her little guy could take them to school to enjoy too. And here you have it, a 4 Ingredient Almond Coconut Cookie Ball recipe that's crisp and crunchy on the outside but soft and chewy in the middle. 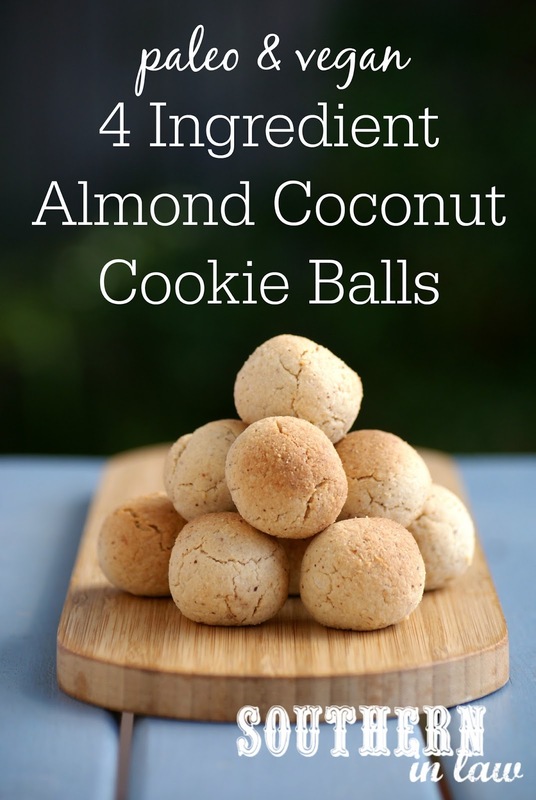 It requires just one bowl and you'll have delicious cookie balls out of the oven in no time at all! Preheat your oven to 180C/355F and line a baking sheet with baking paper. In a bowl, mix your maple syrup and almond butter until smooth. Add in your almond meal and coconut, stirring until combined. Knead the mixture together with your hands. It will feel quite dry at first, however, it will come together. If needed, add a few drops of water. Alternatively, save the mess by pulsing all of the ingredients in your food processor until combined. Roll your mixture into balls and place onto your baking tray. Bake for 8-10 minutes or until golden and crisp. Allow to cool slightly before enjoying! If you want a little something extra, allow them to cool and then drizzle them (or dip!) with melted chocolate. 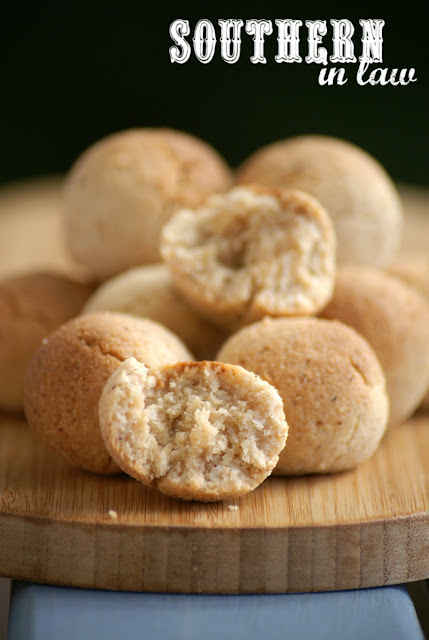 These cookies will keep in an airtight container at room temperature for 2-3 days. 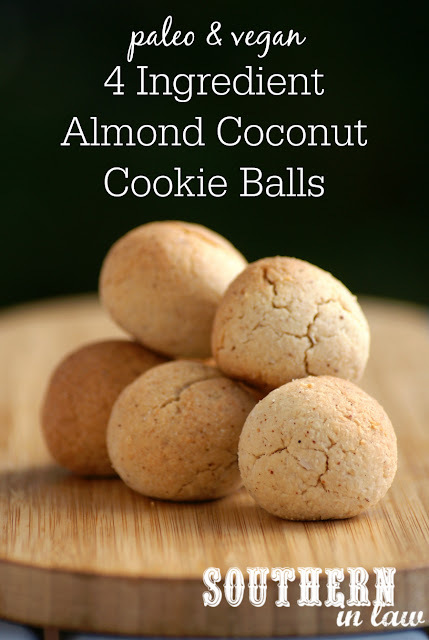 **For a nut free version use sunflower seed butter instead of almond butter and ground sunflower seeds instead of almond meal. But tell me, do you have any food restrictions? What's one thing you don't think ANYONE should miss out on?